AAU Jorhat Recruitment 2018 September | Senior research Fellow (SRF) Posts : Assam Agricultural University (AAU) Jorhat has issued a recruitment notification recently in the month of September. 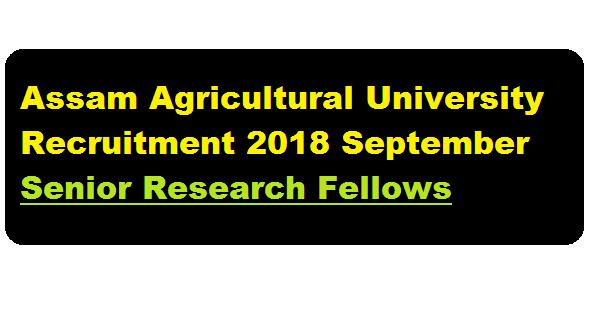 According to the Latest Assam Agricultural University recruitment 2018 September, A walk in interview will be held on 20.09.2018 at 10.00 am in the office of the Director of Extension Education , AAU Jorhat, for selection of a few position of Senior Research Fellows under a centrally funded project “NICRA” at a consolidated pay of Rs. 25,000/- + 10% HRA per month initially for one year but likely to continue till completion of the project subject to satisfactory performance in various Krishi Vigyan Kendras mentioned in detail below. Eligible & Interested candidates from Agriculture background may appear and submit application with copies of certificates & mark sheets and produce originals for verification. No. TA/DA is admissible for the purpose.